Canadian Foreign Affairs Minister Chrystia Freeland, left, Mexico's Secretary of Economy Ildefonso Guajardo Villarreal, center, and U.S. Trade Representative Robert Lighthizer speak during a joint press conference regarding the seventh round of NAFTA renegotiations in Mexico City, Monday, March 5, 2018. MEXICO CITY — The purpose of the trade negotiations here were no longer the priority as members of the three governments involved in the sensitive talks, advisers from the private sector and people on the periphery were not focused on the task at hand. Two days after the seventh round of negotiations for the North American Free Trade Agreement began at Mexico City’s Camino Real hotel, talks of the White House potentially implementing tariffs on aluminum and steel served to “totally overshadow” the negotiations, according to Gerry Schwebel, executive vice president for the International Bank of Commerce. The question that remains is when, if at all, will the U.S. trade priority shift to NAFTA negotiations? “We were saying, ‘OK, can we switch over to NAFTA now?’” said Schwebel, who has also been part of the U.S. private sector involved in each round of the negotiations. After the seventh round concluded this week, President Donald Trump announced on Thursday a 10 percent tariff on aluminum imports and a 25 percent import duty on steel imports. “The initial reaction down here was basically, ‘You’ve already called us subhuman rapists so this is par for the course,’” said former Mexican Congressman Agustín Barrios Gómez, who now serves as president of the Mexico Image Foundation. After initial uncertainty, the Trump administration said Mexico and Canada were exempt from the tariffs, which “has been taken as good news,” Barríos Gómez added. Leo Zuckermann, a columnist from the Excelsior newspaper in Mexico City, wrote in a Thursday column that following the tariff exemption, there’s a sense of optimism in Mexico. Many U.S. lawmakers said Thursday and Friday they were pleased about exempting the two neighboring countries. The peso also strengthened following the tariff announcement. Now, the three countries plan to continue renegotiating the two-decade old agreement, with an eighth round tentatively scheduled for early April. 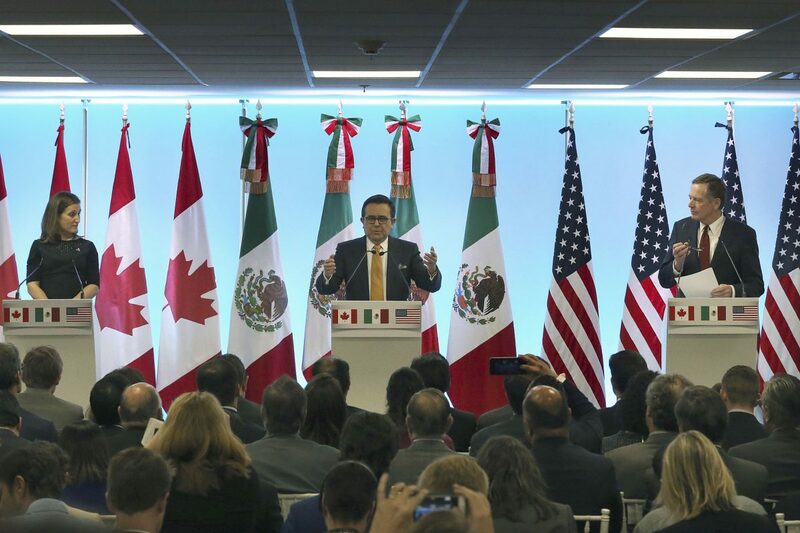 “The negotiation process for the modernization of NAFTA follows its normal course,” the Mexican economy ministry wrote in a statement Friday. Despite the ongoing plans to keep negotiating, a group of seven U.S. representatives — five Democrats and two Republicans — still seemed uneasy about NAFTA’s future. They wrote a letter to Trump on Friday urging him not to withdraw from the pact. Whether the letter will have an impact is uncertain. But the Trump administration’s trade focus appears to be on tariffs more than NAFTA. And with the Mexican presidential election coming in July, negotiations may be put on pause until after the election. So while a withdrawal does not seem likely, officials said, the more pressing question is whether the three countries can reach an agreement on a new trade agreement and assure American businesses of some certainty going forward.